Roseby's Building near the Parliament Record Room stopped. Earl of Peterborough versus Ld. Mounson. Heads for the Conference about a Declaration against those who shall procure Petitions against the Militia. Col. Morgan to raise Forty Men for Holland. Judgement to be given against the Attorney General To-morrow. Lords Lieutenants to take their Commissions for the Militia. Message from the H. C. for a Conference on the Bill for settling the Militia. Answer from the H. C. about a Conference. Capt. Brough to attend, about a scandalous Report against the Lord Lieutenant of Ireland. 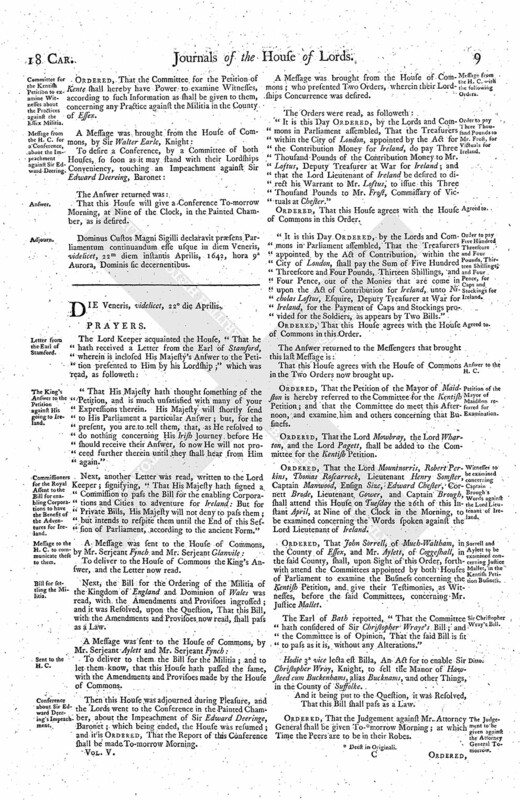 Conference about the Bill for settling the Militia reported. Lady Hastings versus Mr. Poulton. Absent Lords, that are in Town, to pay to the Poor's Box. Wadsworth and Gouldsmith to attend, for searching Lady St. John's House. Message from the H. C. that they agree that a Declaration shall be drawn up against those who shall petition against the Militia. and for putting in Execution the Orders for removing the Magazine from Hull. Committee for the Kentish Petition to examine Witnesses about the Practices against the Essex Militia. Message from the H. C. for a Conference, about the Impeachment against Sir Edward Deering. This House being this Day informed, "That there is a Building erecting, by one Henry Roseby and his Workmen, upon the King's Ground, near His Majesty's House, where the Records of Parliament are kept, contrary to express Orders of this House, which Building hath gone on in Contempt of the said Orders, and the Commands of the Lords in Parliament therein expressed:" It is therefore Ordered, by the Lords in Parliament, That the said Roseby, and all Workmen that shall presume to work upon the said House, shall be served with this Order, and they strictly commanded, as they at their Perils will answer the contrary, not to proceed in the said Building, until the Pleasure of this House be further signified. Their Lordships, or any Two, to meet To-morrow in the Afternoon, in the Painted Chamber. Upon Report made from the Committee concerning the Earl of Peterborough's Petition, touching the Lord Mounson, "That the Opinion of the Committee was, That, in regard the Lord Mounson is a Member of the House of Commons, it is fit to have a Conference with the House of Commons about it, and to desire them to take the same into their Consideration." Hereupon this House Ordered, That this Business shall be a Part of the next Conference. "To let the House of Commons know, that this Conference is desired concerning the Kentish Petition, upon the Informations this House hath received, that it is yet, by the malignant and ill-affected Party, with great though secret Industry carried on, and not only in that County, but some others of this Kingdom; and, as it may have an ill Consequence, and a dangerous Effect, in the Disturbance of what the Parliament hath settled for the present Safety of the Kingdom, that the Desire of this House is, that the Delinquents, and such as have been Actors in this Petition, may speedily be brought to their Trial; and that forthwith there may be a Declaration made unto the Kingdom, that whosoever shall be found to further or to countenance this Petition, or any other of the like Nature, shall be held to be Disturbers of the Peace and Quiet of this Kingdom, and justly liable to the Censure of Parliament; and those that shall discover and give Information of such Practices shall be accounted to do an acceptable Service to the King and Parliament." Ordered, That this House approves of these Heads to be delivered at the next Conference with the House of Commons. To desire a Conference, as soon as it may stand with their Conveniency, in the Painted Chamber, touching a Declaration to be made against Counter Petitions in Kente, and other Counties, against the Militia; and also touching a Matter of Privilege concerning a Member of their House. Ordered, That Colonel Morgan shall have Leave to entertain and transport into Holland Forty Men, Voluntiers, for recruiting of his Regiment in the Service of The States of the United Provinces. Ordered, That this House will give Judgement against Mr. Attorney General To-morrow Morning, upon the Impeachment brought up against (fn. 1) him from the House of Commons, at which Time the Peers are to be in their Robes; and further it is Ordered, That the Warden of The Fleet shall bring Mr. Attorney before their Lordships To-morrow Morning. Ordered, That those Lords Lieutenants, that have not taken out their Commissions for the Militia, shall take them forth presently. To desire a Conference, by a Committee of both Houses, as soon as it may stand with their Lordships Conveniency, touching the Bill concerning the Militia. That this House will give a present Conference, in the Painted Chamber, as is desired. That they will give their Lordships a present Conference, in the Painted Chamber, as is desired. Ordered, That Mr. Justice Heath do certify the Business referred unto him, concerning Mr. Wingfeild and Mr. Woolley Leigh, To-morrow Morning. The Lord Lieutenant of Ireland acquainted the House this Day, "That one Captain Brough hath spread abroad a scandalous and false Report, That there hath been Fifty Pounds (fn. 2) given for a Captain's Place, to serve in the Wars of Ireland; and because his Lordship conceived this to intrench upon his Honour, and the Dignity of the Place he holds in Ireland under His Majesty, he desired that their Lordships would be pleased to examine this Business to the Bottom, that so his Lordship's Honour may be vindicated, and such Reparation may be given him as their Lordships shall think fit:" Hereupon this House Ordered, That Captain Brough shall be summoned, to appear before this House To-morrow Morning, and then this House will examine this Business. Then this House was adjourned during Pleasure, and the Lords went to the Conference; which being ended, this House was resumed. 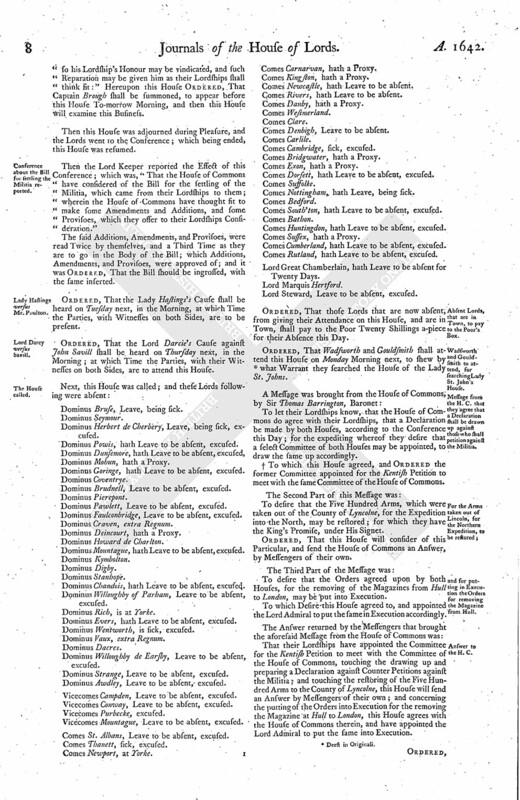 Then the Lord Keeper reported the Effect of this Conference; which was, "That the House of Commons have considered of the Bill for the settling of the Militia, which came from their Lordships to them; wherein the House of Commons have thought fit to make some Amendments and Additions, and some Provisoes, which they offer to their Lordships Consideration." The said Additions, Amendments, and Provisoes, were read Twice by themselves, and a Third Time as they are to go in the Body of the Bill; which Additions, Amendments, and Provisoes, were approved of; and it was Ordered, That the Bill should be ingrossed, with the same inserted. Ordered, That the Lady Hastings's Cause shall be heard on Tuesday next, in the Morning, at which Time the Parties, with Witnesses on both Sides, are to be present. Ordered, That the Lord Darcie's Cause against John Savill shall be heard on Thursday next, in the Morning; at which Time the Parties, with their Witnesses on both Sides, are to attend this House. Dominus Bruse, Leave, being sick. Dominus Herbert de Cherbery, Leave, being sick, excused. Dominus Powis, hath Leave to be absent, excused. Dominus Dunsemore, hath Leave to be absent, excused. Dominus Mohun, hath a Proxy. Dominus Goringe, hath Leave to be absent, excused. Dominus Brudnell, Leave to be absent, excused. Dominus Pawlett, Leave to be absent, excused. Dominus Faulconbridge, Leave to be absent, excused. Dominus Deincourt, hath a Proxy. Dominus Mountague, hath Leave to be absent, excused. Dominus Chandois, hath Leave to be absent, excused. Dominus Willoughby of Parham, Leave to be absent, excused. Dominus Rich, is at Yorke. Dominus Evers, hath Leave to be absent, excused. Dominus Wentworth, is sick, excused. Dominus Willoughby de Earsby, Leave to be absent, excused. Dominus Strange, Leave to be absent, excused. Dominus Awdley, Leave to be absent, excused. Vicecomes Campden, Leave to be absent, excused. Vicecomes Conway, Leave to be absent, excused. Vicecomes Mountague, Leave to be absent, excused. Comes St. Albans, Leave to be absent, excused. Comes Carnarvan, hath a Proxy. Comes Kingston, hath a Proxy. Comes Newcastle, hath Leave to be absent. Comes Rivers, hath Leave to be absent. Comes Danby, hath a Proxy. Comes Denbigh, Leave to be absent. Comes Bridgwater, hath a Proxy. Comes Exon, hath a Proxy. Comes Dorsett, hath Leave to be absent, excused. Comes Nottingham, hath Leave, being sick. Comes South'ton, hath Leave to be absent, excused. Comes Huntingdon, hath Leave to be absent, excused. Comes Sussex, hath a Proxy. Comes Cumberland, hath Leave to be absent, excused. Comes Rutland, hath Leave to be absent, excused. Lord Great Chamberlain, hath Leave to be absent for Twenty Days. Lord Steward, Leave to be absent, excused. Ordered, That those Lords that are now absent, from giving their Attendance on this House, and are in Town, shall pay to the Poor Twenty Shillings a-piece for their Absence this Day. Ordered, That Wadsworth and Gouldsmith shall attend this House on Monday Morning next, to shew by (fn. 3) what Warrant they searched the House of the Lady St. Johns. To let their Lordships know, that the House of Commons do agree with their Lordships, that a Declaration be made by both Houses, according to the Conference this Day; for the expediting whereof they desire that a select Committee of both Houses may be appointed, to draw the same up accordingly. 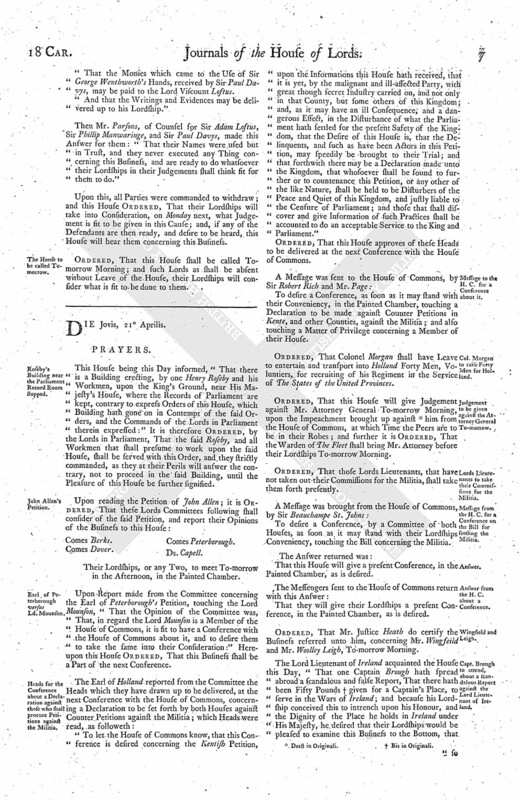 † To which this House agreed, and Ordered the former Committee appointed for the Kentish Petition to meet with the same Committee of the House of Commons. To desire that the Five Hundred Arms, which were taken out of the County of Lyncolne, for the Expedition into the North, may be restored; for which they have the King's Promise, under His Signet. Ordered, That this House will consider of this Particular, and send the House of Commons an Answer, by Messengers of their own. To desire that the Orders agreed upon by both Houses, for the removing of the Magazines from Hull to London, may be put into Execution. To which Desire this House agreed to, and appointed the Lord Admiral to put the same in Execution accordingly. That their Lordships have appointed the Committee for the Kentish Petition to meet with the Committee of the House of Commons, touching the drawing up and preparing a Declaration against Counter Petitions against the Militia; and touching the restoring of the Five Hundred Arms to the County of Lyncolne, this House will send an Answer by Messengers of their own; and concerning the putting of the Orders into Execution for the removing the Magazine at Hull to London, this House agrees with the House of Commons therein, and have appointed the Lord Admiral to put the same into Execution. Ordered, That the Committee for the Petition of Kente shall hereby have Power to examine Witnesses, according to such Information as shall be given to them, concerning any Practice against the Militia in the County of Essex. That this House will give a Conference To-morrow Morning, at Nine of the Clock, in the Painted Chamber, as is desired. Dominus Custos Magni Sigilli declaravit præsens Parliamentum continuandum esse usque in diem Veneris, videlicet, 22m diem instantis Aprilis, 1642, hora 9a Aurora, Dominis sic decernentibus.